The alarmist media is largely ignoring the huge, near-fatal blow to climate alarm from the new paper finding that not only is there no "missing heat" in the deep oceans, which was previously the preferred excuse du jour to explain the 18+ year "pause" in global warming, the observations instead show the deep oceans cooled from 2005-2013. Instead, the MSM are preferring to highlight a companion paper published in the same issue of Nature Climate Change, which claims models show that the Southern Hemisphere oceans must have warmed much faster than the actual observations, thus the "missing heat" has re-emerged and it's much worse than we thought! [in the models]. As Dr. Roger Pielke Sr. quickly pointed out, however, "When observations and models disagree, to accept the model is an inversion of the scientific process!" and "For model results to trump observations is absurd!" Indeed, and as examination of Fig. 5 from the paper shows, the authors have used a modeled excuse to claim the Southern Hemisphere oceans have warmed up to an amazing 152% more than the actual data [e.g. see red bar at lower right of Fig 5 below]. Further, they claim the modeled artificial warming added to the observed ocean data [which is everything above the white horizontal lines in each colored bar below] is even warmer than the overheated modeled mean heat content change [shown by grey bars]. With these unjustified up-justments, the Southern Hemisphere oceans are claimed to have warmed significantly more than the Northern Hemisphere oceans, even though it is well-known that surface temperatures did the opposite. 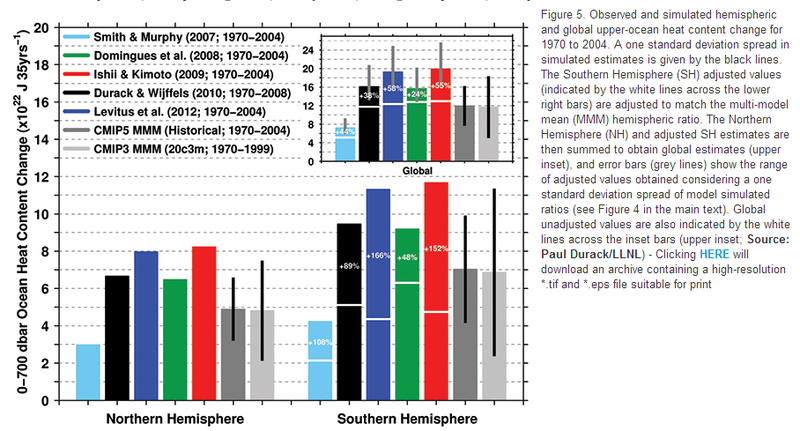 This added artificial, modeled warming of the Southern Hemisphere oceans was then added by the authors to the Northern Hemisphere observed data to artificially raise the global heat content change by up to 58% above the previously published values shown by the colored bars in the upper right corner of Fig. 5. Bottom line: This is an astonishingly brazen and flawed attempt to up-just observed data in support of global warming alarm, using falsified black-box models as "justification" for these anti-scientific methods. Further, even with this unjustified up-justing of data, the global oceans warmed only a tiny ~0.09C +58% = 0.14C [using Levitus et al 2012 above], i.e. ~14 hundreds of one degree since 1970. And that 0.14C, even if real, cannot pop out again to heat the atmosphere. Even if it could violate the 2nd law of thermodynamics and principle of maximum entropy production by "popping out," the maximum that 0.14C ocean warming could reheat the atmosphere is limited to an insignificant 0.14C.